For procedural reasons, Cruz's remarks, however long, do not constitute a true filibuster; the vote to move forward with government-funding legislation is scheduled to begin after noon on Wednesday and will go forward regardless. Twitter quickly dubbed his stand a "fauxlibuster" or -- perfect for its invocation of vacuous, feel-good nonsense-speech -- a "Ted Talk." Invoking the Nazis, the Soviet Union, and the Little Engine That Could, Cruz styled himself the lone crusader for right against a formidably equipped enemy. Nearly to a one, Republicans want to get rid of Obamacare. But most also worry Cruz's defund crusade will lead to a government shutdown that hurts the GOP politically. Leaving aside the policy or even the political advisability of Cruz's undertaking, though, there are a couple of basic logical problems with what he's trying to do, as the conservative writer David Freddoso pointed out on the Conservative Intelligence Briefing website on Sunday. 1. He's trying to block the same bill he says he wants to pass. Cruz and his fellow defunders pushed the Republican-controlled House of Representatives to pass a bill funding the federal government but stopping funding for health-care-reform implementation. The House obeyed and passed the bill on Friday. 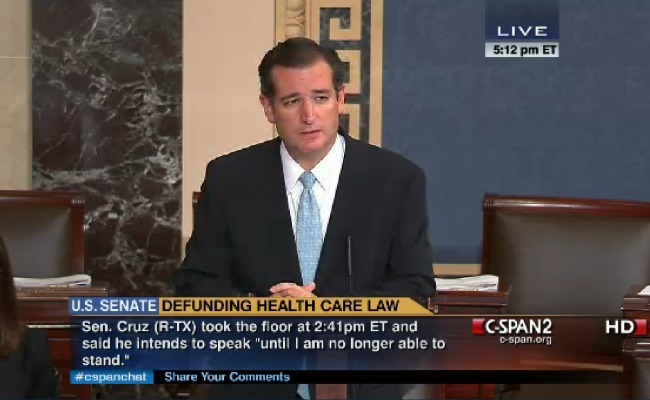 But now that the Senate is considering the bill, Cruz wants to prevent it from being voted on. "If you’re really interested in putting pressure on Democrats to heed their constituents and vote to defund Obamacare, then you make them take the very vote that Cruz is trying to prevent from happening," Freddoso writes. 2. Shutting down the government wouldn't stop Obamacare. On Fox News on Friday, Cruz proposed passing piecemeal funding bills for "different pieces of the government," such as the military, implying Congress could fund other government functions while omitting Obamacare. But that's wrong -- the money for Obamacare isn't at stake in the continuing resolution currently under consideration. It's "mandatory" spending, akin to Medicare and Social Security, and would require action by Congress to revoke. "I’m convinced that most conservatives who have bought into [Cruz's] strategy have been misled to believe we can hold off Obamacare for a while with a government shutdown," Freddoso writes. "Obamacare is already funded, and that won’t change if this bill gets stalled by a filibuster. During the shutdown, the Marines don’t get paid, but Obamacare gets funded." Conservatives can cheer Cruz for grabbing the nation's attention and giving an impassioned, high-profile speech. But, Freddoso argues, they shouldn't pretend this is a practical step toward stalling legislation they hate. As he wrote in another post: "This plan is right out of Alice in Wonderland. You need to prevent a vote on defunding Obamacare in order to defund Obamacare." Good luck with that, Senator.